The invention provides a transdermal therapeutic system (TTS) containing rotigotine as the active ingredient. The TTS is useful in the treatment of Parkinson's Disease because it induces a pharmacokinetic profile where the rotigotine plasma level is high and stable. This application claims the benefit of U.S. Provisional Application Nos. 60/613,760 and 60/613,761, both filed Sep. 29, 2004, and U.S. Ser. No. 10/139,894, filed May 7, 2002, which claims the benefit of U.S. Provisional Application No. 60/363,638, filed Mar. 12, 2002 and U.S. Ser. No. 10/140,096, filed May 7, 2002 which claims the benefit of U.S. Provisional Application No. 60/363,655 filed Mar. 12, 2002. The entire contents of these applications are herein incorporated by reference. Various references are cited through out the application to more fully describe the subject matter of the invention. These references are hereby incorporated in their entirety. The present invention relates to a skin patch (also known as a Transdermal Therapeutic System (TTS)) that delivers a sufficient amount of rotigotine, at a sufficient rate, to treat or alleviate the symptoms of Parkinson's Disease or Restless Legs Syndrome. The dopaminergic system uses dopamine as a neurotransmifter and plays a key role in the pathogenesis of a number of diseases including Parkinson's Disease, Alzheimer's Disease, Huntington's Disease and Schizophrenia (Seigel, G., et al, Basic Neurochemistry, 4th Ed., 1989, pp 815-822 and 864-866). The dopaminergic system has also been implicated with respect to depression (Dougherty, D., et al., J. Clin. Psychiatry, 1998; 59, Suppl 5:60-63), Restless Legs Syndrome (RLS) (Trenkwalder, C., et al. Lancet Neurol. 2005 August;4(8):465-75.) and Periodic Limb Movement in Sleep PLMS (O'Brien, C., CNI Review Medical Journal, Spring 1999, Volume 10, No. 1). Parkinson's Disease is primarily a disease of middle age and beyond, and it affects both men and women. The highest rate of occurrence of Parkinson's Disease is in the age group over 70 years old, where Parkinson's Disease exists in 1.5 to 2.5% of that population. The mean age at onset is between 58 and 62 years of age, and most patients develop Parkinson's Disease between the ages of 50 and 79. There are approximately 800,000 people in the United States alone with Parkinson's Disease. Parkinson's Disease is believed to be primarily caused by the degeneration of dopaminergic neurons in the substantia nigra. This, in effect, results in loss of tonic dopamine secretion and dopamine-related modulation of neuronal activity in the caudate nucleus, and thus in a deficiency of dopamine in certain brain regions. The resulting imbalance of neurotransmitters acetylcholine and dopamine eventually results in disease related symptoms. Although usually regarded as a motor system disorder, Parkinson's Disease is now considered to be a more complex disorder that involves both motor and nonmotor systems. This debilitating disease is characterized by major clinical features including tremor, bradykinesia, rigidity, dyskinesia, gait disturbances, and speech disorders. In some patients, dementia may accompany these symptoms. Involvement of the autonomic nervous system may produce orthostatic hypotension, paroxysmal flushing, problems with thermal regulation, constipation, and loss of bladder and sphincter control. Psychological disorders such as loss of motivation and depression may also accompany Parkinson's Disease. Early motor deficits of Parkinson's Disease can be traced to incipient degeneration of nigral dopamine-releasing cells. This neuronal degeneration produces a defect in the dopamineric pathway that connects the substantia nigra to the striatum. As the disease progresses, refractory motor, autonomic, and mental abnormalities may develop, which implies that there is progressive degeneration of striatal receptor mechanisms. The clinical diagnosis of Parkinson's Disease is based on the presence of characteristic physical signs, e.g., tremor, rigidity of skeletal muscles, bradykinesia, impairment of postural reflexes, and gait distrubances. The disease is known to be gradual in onset, slowly progressive, and variable in clinical manifestation. Evidence suggests that the striatal dopamine content declines to 20% below levels found in age-matched controls before symptoms occur. Treatment of Parkinson's Disease has been attempted with, inter alia, L-dopa, which still is the standard for the therapy of Parkinson's Disease. L-dopa is a compound that passes the blood-brain barrier as a precursor for dopamine and is then converted into dopamine in the brain. L-dopa improves the symptoms of Parkinson's Disease but may cause severe side effects. Moreover, the drug tends to lose its effectiveness after the first two to three years of treatment. After five to six years, only 25% to 50% of patients on L-dopa therapy maintain improvement. Furthermore a major drawback of currently utilized therapies for Parkinson's Disease is the eventual manifestation of the “fluctuation syndrome,” which results in “all-or-none” conditions characterized by alternating “on” periods of mobility with dyskinesias and “off” periods with hypokinesia or akinesia. Patients who display unpredictable or erratic “on-off” phenomena with oral anti-Parkinson therapy have a predictable beneficial response to intravenous administration of L-dopa and other dopamine agonists, suggesting that fluctuations in plasma concentrations of drug are responsible for the “on-off” phenomena. The frequency of “on-off” fluctuations has also been improved by continuous infusions of the dopamine receptor agonists apomorphine and lisuride. However, this mode of administration is inconvenient. Therefore, other modes of administration providing a more stable plasma level would be beneficial. As mentioned above, one treatment approach for Parkinson's Disease involves dopamine receptor agonists. Dopamine receptor agonists, sometimes also referred to as dopamine agonists, are substances which, while structurally different from dopamine, bind to dopamine receptors and trigger an effect which is comparable to that of dopamine. Due to the reduced side-effects, it is advantageous when the substances selectively bind to or interact with one or a subset of the known dopamine receptor subtypes. At present there are several classes of identified dopamine receptor subtypes, the most well characterized being the D1, D2, and D3 receptors. To date, various TTS's for the administration of rotigotine have been described. Published PCT Application No. WO 94/07468 discloses a transdermal therapeutic system containing rotigotine hydrochloride as active substance in a two-phase matrix which is essentially formed by a hydrophobic polymer material as the outer phase and a disperse hydrophilic phase contained therein and mainly containing the drug and hydrated silica. The silica enhances the maximum possible loading of the TTS with the hydrophilic salt. Moreover, the formulation disclosed in WO 94/07468 usually contains additional hydrophobic solvents, permeation-promoting substances, dispersing agents and, in particular, an emulsifier which is required to emulsify the aqueous solution of the active principle in the lipophilic polymer phase. A TTS prepared by using such a system has been tested in healthy subjects and Parkinson patients. The average drug plasma levels obtained by using this system were around 0.15 ng/mL with a 20 cm2 patch containing 10 mg rotigotine hydrochloride. This level is considered too low to achieve a truly efficacious treatment or alleviation of the symptoms related to Parkinson's Disease. Various further transdermal therapeutic systems have been described in Published PCT Application No. WO 99/49852. The TTS used in this patent application comprises a backing layer, inert with respect to the constituents of the matrix, a self-adhesive matrix layer containing an effective quantity of rotigotine or rotigotine hydrochloride and a protective film which is removed before use. The matrix system is composed of a non-aqueous polymer adhesive system, based on acrylate or silicone, with a solubility of rotigotine of at least 5% W/W. The matrix system is essentially free of inorganic silicate particles. In Examples 1 and 2 and in FIG. 1 of WO 99/49852, two transdermal therapeutic systems are compared. These are based on acrylate or silicone adhesives. FIG. 1 of WO 99/49852 shows that a silicone patch releases about the same amount of active principle through the skin as an acrylate patch. This has been demonstrated by the almost identical drug flux rates in an in vitro model, independent of the adhesive test system employed. Therefore an identical flux rate through human skin was expected. It should be noted that the drug content of the silicone patch used in WO 99/49852 was lower than the drug content used in the acrylate patch. This merely reflects the difference in drug release capacity, however, in the respective polymeric silicone and acrylate adhesives used in Examples 1 and 2 of the published PCT application, respectively. While the acrylate system is able to dissolve more drug than the silicone system, silicone allows for a faster release of the drug to the skin. As these two effects compensate each other, it has been thought that the acrylate and the silicone system used in WO 99/49852 are about equivalent in the obtainable drug plasma levels and, hence, in therapeutic efficacy. The shortcomings of the silicone formulation disclosed in WO 94/07468 have led to clinical tests (safety and pharmacokinetic studies) of only the acrylate-based TTS of Example 1 of WO 99/49852. The mean steady flux rate across human skin in vitro of this TTS amounted to 15.3 μg/cm2/h. Even the acrylate-based TTS, however, exhibited unsatisfactory plasma levels of rotigotine that are too low to allow for a really efficacious treatment of Parkinson's Disease. A 30 mg (20 cm2) patch only yielded a mean maximum plasma concentration of 0.12 ng/mL, while a 5 cm2 patch containing 7.5 mg yielded a mean maximum plasma concentration of 0.068 ng/mL. Again, such values are too low to provide a real therapeutic progress in the treatment of Parkinson's Disease. In sum, neither the 20 cm2 silicone patch disclosed in WO 94/07468 nor the 20 cm2 acrylate patch disclosed in WO 99/49852 provided sufficient drug plasma levels to provide a satisfactory therapeutic effectiveness in the treatment of Parkinson's Disease. The Restless Legs Syndrome (RLS) is a neurological disease that expresses itself as a false sensation in the legs accompanied by a strong kinetic urge. Symptoms of RLS include tingling, pulling, aching, itching, burning, cramps or pain, causing in the person concerned the irresistible urge to move. This disorder occurs most frequently when the person concerned is resting. It is particularly during the night's sleep that this sensory disorder with its attendant kinetic urge leads to restlessness and sleep interruptions. RLS can occur at any age but increases in frequency as persons grow older. It afflicts about 10% of the general population. Because of the nature of the symptoms, RLS is one of the most prevalent causes of sleep disturbances. In 20-40 year-olds, RLS accounts for 5%, in 40-60 year-olds for 20% and in those over 60 years of age for 35% of their sleeping-waking problem. Once the quality of sleep and thus of life of a patient has increasingly deteriorated due to RLS or the patient suffers from daytime somnolence, the need for therapy is indicated. Such need for therapy usually sets in at the age of 40-50 (U.S. Patent Application Publication No. 2004/0048779, paragraphs 0002 to 0005). Therapy studies have revealed a diversity of results obtained in monotherapeutic treatments with dopamine agonists, opiates, benzodiazepines, carbamazepine, clonidine or levodopa (L-DOPA) in combination with a dopa decarboxylase inhibitor. The use of L-DOPA for treating RLS has been the subject of a particularly large number of papers. Long-term L-DOPA therapy leads to a clear mitigation of the disorder with an improved quality of sleep and life. The drawback of L-DOPA therapy, however, lies in the fact that in a great many patients its effectiveness tapers off and/or the RLS problem is shifted toward the morning hours (rebound) or the disorder is aggravated with the problem occurring even during the day (augmentation) (U.S. Patent Application Publication No. 2004/0048779, paragraph 0006). Administration of rotigotine has been shown to lead to the suppression and reduction of RLS symptoms (U.S. Patent Application Publication No. 2004/0048779, paragraph 0012). Based on the results of human clinical trials involving both healthy subjects and early-stage Parkinson's patients the inventors have found that a transdermal therapeutic system (TTS) comprising a silicone matrix and rotigotine in its free base form produces a rotigotine pharmacokinetic profile with unexpectedly high plasma levels of rotigotine, a controlled release, substantially stable rotigotine blood plasma levels over time, and substantially uniform rotigotine plasma levels when the patch is placed at a variety of skin sites. For example, the inventors have demonstrated that a silicone-based TTS containing rotigotine in the free base form provides mean maximum drug plasma levels in the range of almost 0.5 ng/mL for a 20 cm2 silicone patch containing 9 mg of rotigotine. As such, the invention contemplates a treatment regimen that allows for repeated daily administration that achieves a steady state plasma concentration effective for alleviating symptoms of Parkinson's Disease. In particular, the methods of this invention produce continuous rotigotine plasma levels, which can be a more effective treatment than regimens producing pulsatile plasma levels. The invention relates to methods for providing substantially controlled release of rotigotine and for inducing substantially steady-state rotigotine pharmacokinetic profiles over 24 hour period in a human patient in need thereof is provided, wherein the Cmax of rotigotine is from about 0.14 ng/mL to about 1.54 ng/mL and the AUC0-t is from about 3.3 ng/mL*h to about 32.2 ng/mL*h, said method comprising administering rotigotine to said human patient. In other aspects, the invention relates to methods for providing substantially controlled release of rotigotine and for inducing substantially steady-state rotigotine pharmacokinetic profiles over other and longer time periods, wherein the human patent suffers from Parkinson's Disease, Restless Legs Syndrome or another disease associated with the dopaminergic system. The invention also relates to methods for multiple administrations of rotigotine patches, and to methods for providing substantially controlled release of rotigotine and for inducing substantially steady-state rotigotine pharmacokinetic profiles by placing rotigotine skin patches at various skin sites. The methods of the invention encompass administration of rotigotine in various intervals effective to sustain a Cmax at a level from about 0.14 ng/mL to about 1.54 ng/mL and the mean area under the curve (AUCo-t) at a level from about 3.3 ng/mL*h to about 32.2 ng/mL*h. The invention also relates to methods that involve rotating the transdermal application site on a daily basis, wherein the pharmacokinetic profiles remain unchanged. In another aspect, the invention relates to a controlled release rotigotine formulation for transdermal administration to human patients, comprising from about 4 to about 20 mg rotigotine, where the formulation provides a mean maximum plasma concentration (Cmax) of rotigotine from about 0.14 ng/mL to about 1.54 ng/mL and a mean area under the curve up to the last quantifiable concentration (AUCOT) from about 3.3 ng/mL*h to about 32.2 ng/mL*h.
In other, preferred aspects of the invention, the Cmax of rotigotine induced by the formulation is from about 0.20 ng/mL to about 1.30 ng/mL; from about 0.30 ng/mL to about 1.20 ng/mL; from about 0.14 ng/mL to about 0.48 ng/mL; from about 0.37 ng/mL to about 0.75 ng/mL; or from about 0.84 ng/mL to about 1.54 ng/mL. In yet other preferred aspects of the invention, the induced Cmax is about 0.31 ng/mL; about 0.56 ng/mL; or about 1.19 ng/mL. In other aspects of the invention, the induced area-under-the-curve of the pharmacokinetic profile over time “t” (“AUC0-t”) is from about 4.0 ng/mL*h to about 30.0 ng/mL*h; from about 5.0 ng/mL*h to about 25.0 ng/mL*h; from about 3.3 ng/mL*h to about 8.9 ng/mL*h; from about 7 ng/mL*h to about 15.2 ng/mL*h; or from about 15.2 ng/mL*h to about 32.2 ng/mL*h. In other aspects, the induced AUC0-t is about 6.1 ng/mL*h; about 11.1 ng/mL*h; or about 23.7 ng/mL*h.
In another aspect of the invention, a method for treating Parkinson's Disease in human patient is provided, comprising administering rotigotine which, upon administration, provides a Cmax of from about 0.14 ng/mL to about 1.54 ng/mL and wherein the AUC0-t is from about 3.3 ng/mL*h to about 32.2 ng/mL*h.
In another aspect of the invention, a method for treating Restless Legs Syndrome in human patient is provided, comprising administering rotigotine which, upon administration, provides a Cmax of from about 0.14 ng/mL to about 1.54 ng/mL and wherein the AUC0-t is from about 3.3 ng/mL*h to about 32.2 ng/mL*h.
In one embodiment, the invention relates to a controlled release rotigotine formulation for transdermal administration to human patients, wherein said formulation gives the same pharmacokinetic profile regardless of where it is applied on the body of said human patient. In a preferred embodiment, the patient is suffering from Parkinson's disease. In another preferred embodiment, the patient is suffering from Restless Legs Syndrome. FIG. 1—Mean (±standard deviation) rotigotine plasma concentrations (in ng/mL) during and after single transdermal administration of 9.0 mg rotigotine with Patch A. FIG. 2—Mean (±standard deviation) rotigotine plasma concentrations (in ng/mL) during and after single transdermal administration of 18.0 mg rotigotine with 2× Patch A. FIG. 3—Mean (±standard deviation) rotigotine plasma concentrations (in ng/mL) during and after single transdermal administration of 33.48 mg rotigotine (state) with Patch B. FIG. 4—Mean (±standard deviation) rotigotine plasma concentrations (in ng/mL) during and after multiple transdermal administration of 4.5 mg rotigotine with Patch C.
FIG. 5—Mean (±standard deviation) rotigotine plasma concentrations (in ng/mL) during and after last transdermal administration of 4.5 mg rotigotine with Patch C.
FIG. 6—Mean (±standard deviation) rotigotine plasma concentrations (in ng/mL) during and after single transdermal administration of 4.5 mg rotigotine with Patch D.
FIG. 7—Mean (±standard deviation) rotigotine plasma concentrations (in ng/mL) during and after single transdermal administration of 4.5 mg rotigotine with Patch C.
FIG. 8—Mean plasma concentrations versus time for each of the six application sites using combined data from Days 27 and 30 (after normalization by body weight and apparent dose). FIG. 9—Plasma concentration over time for all patch application sites (after normalization by body weight and apparent dose). FIG. 10—Arithmetic mean and standard deviation of the rotigotine plasma concentrations (ng/mL) during titration and maintenance phase. Transdermal therapeutic systems (TTS) of the present invention may be prepared using methods known in the art or as described in Published U.S. Patent Application Nos. US2003/0026830 and US2003/0027793 and U.S. Pat. No. 6,884,434, the disclosure of which as they relate to preparation of TTS's are incorporated by reference herein in their entirety. In an embodiment, a TTS of the present invention is reservoir or matrix type transdermal system composed of one or more layers. In a further embodiment the TTS includes a backing layer and a liner layer that is removed prior to use. (3) a protective liner, comprising of a transparent fluoropolymer-coated polyester film, which liner is removed prior to application. A preferred process for making the TTS is described in U.S. Patent Application Publication No. US 2003/0026830 at paragraphs 3842 and U.S. Patent Application Publication No. US 2003/0027793 at paragraphs 3741, which are incorporated herein by this reference. A preferred TTS of the present invention may contain from about 4 to about 20 mg of the rotigotine free base. In preferred embodiments, the TTS contains about 4.5 mg of the rotigotine free base, about 9 mg of the rotigotine free base, about 13.5 mg of the rotigotine free base, or about 18 mg of the rotigotine free base. In another preferred embodiment, the TTS contains 5-25% (w/w) rotigotine. In a preferred embodiment of the present invention, the TTS is in the form of a patch. The release surface area of the patch may be from about 10 cm2 to about 40 cm2. In preferred embodiments of the present invention, the release surface area of the patch is about 10 cm2, about 20 cm2, about 30 cm2, or about 40 cm2. A preferred embodiment of the invention utilizes a TTS containing one or more of the following: a pharmaceutically acceptable carrier (e.g., polyvinylpyrrolidone), sodium bisulfite, ascorbyl palmitate, DL-alpha-tocopherol, an amine resistant high tack silicone adhesive (e.g., BIO-PSA® Q74301; Dow Corning), and an amine resistant medium tack silicone adhesive (e.g., BIO-PSA® Q74201, Dow Corning). For example, a preferred 20 cm2 patch TTS contains the components in the amounts described in Table 1. In a particularly preferred embodiment, the TTS comprises a self-adhesive matrix layer containing the free base of rotigotine in an amount effective for the treatment of the symptoms of Parkinson's Disease or restless legs syndrome (RLS), wherein the matrix is based on a silicone-based polymer adhesive system in which rotigotine free base is dispersed; a backing layer inert to the components of the matrix layer; and a protective foil or sheet covering the matrix layer to be removed prior to use. The TTS may also further comprise inert fillers to improve cohesion, e.g. 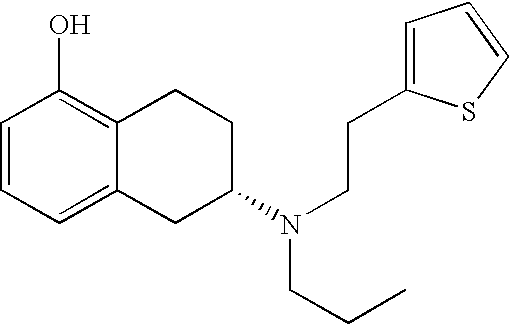 polyvinylpyrrolidone. The TTS may also further comprise additives that facilitate a homogeneous dispersion of rotigotine particles in the form of hydrophilic polymers (e.g., polyvinylpyrrolidone, a copolymer of vinylpyrrolidone and vinylacetate, and a copolymer of ethylene and vinylacetate). When the above-mentioned hydrophilic polymer is polyvinylpyrrolidone, the polyvinylpyrrolidone is present in the active substance-containing matrix layer in the form of insoluble particles at a concentration of 1.5-5% (w/w). In one preferred embodiment, a TTS of the present invention is used to treat Parkinson's Disease or restless legs syndrome (RLS). As is used herein, the term “treatment” is meant to designate a treatment or alleviation of the symptoms of Parkinson's Disease or RLS, rather than a real causative treatment leading to a complete cure. In an embodiment of the invention, the Cmax of rotigotine induced by the formulation is from about 0.20 ng/mL to about 1.30 ng/mL; from about 0.30 ng/mL to about 1.20 ng/mL; from about 0.14 ng/mL to about 0.48 ng/mL; from about 0.37 ng/mL to about 0.75 ng/mL; or from about 0.84 ng/mL to about 1.54 ng/mL. In yet other preferred aspects of the invention, the induced Cmax is about 0.31 ng/mL; about 0.56 ng/mL; or about 1.19 ng/mL. In another preferred embodiment, the TTS is used in a method for treating Parkinson's Disease in humans, comprising administering rotigotine which, upon administration, provides a Cmax of from about 0.14 ng/mL to about 1.54 ng/mL and wherein the AUC0-t is from about 3.3 ng/mL*h to about 32.2 ng/mL*h.
The invention contemplates a TTS used to administer 0.5 mg to 20 mg rotigotine over a 24 hour period. In preferred embodiments, a TTS of the present invention is used to administer 2, 4, 6, or 8 mg rotigotine over a 24 hour period. In certain embodiments, the TTS used to deliver the aforementioned dosages contains, at the time of application, 4.5, 9, 13.5, or 18 mg rotigotine, respectively. When applied once daily, a TTS of the present invention produces a sustained and relatively stable rotigotine plasma level. FIGS. 1-2 show a sustained and relatively stable rotigotine plasma level over a 24 hour period after single administration of a preferred patch (described in Example 1). In animal models of Parkinson's Disease, the presence of stable plasma levels of dopamine agonists such asrotigotine resulted in lower incidence of diskinesias compared to pulsatile plasma levels produced by intermittent administration. Chase, T. N., Drugs 55 Suppl. 1: 1-9 (1998); Stocchi, F. and Olanow, C. W., Neurology 62 (1 Suppl. 1): S56-S63 (2004). Rotigotine is released at a controlled rate following application of a TTS of the present invention to the skin. Approximately 45% of the rotigotine content of the TTS is released within 24 hours. Steady-state rotigotine plasma concentrations are reached after one to two days of transdermal administration and are maintained by once daily application of the TTS, where the TTS is worn by the patient for 24 hours. In the clinical trials of rotigotine effectiveness using neupro™, the mean trough plasma concentrations of rotigotine were stable over the six months of maintenance treatment. The bioavailability of rotigotine was similar across all application sites. FIG. 9 shows that the AUC0-t and the Cmax, for example, are comparable whether the TTS of the present invention is administered to the hip, shoulder, upper arm, thigh, abdomen or flank. Rotigotine plasma levels have been determined in unconjugated blood samples or conjugated blood samples. Exposure to rotigotine from daily application of the TTS of the present invention in healthy subjects and Parkinson's Disease patients exhibited a consistent exposure profile. Repeated daily administration resulted in stable plasma levels. After removal of the TTS, plasma levels decrease with an elimination half-life life of 5 to 7 hours. Pharmacokinetic parameters observed after single dose or multiple dose application of a preferred TTS of the present invention to healthy subjects are summarized in Table 2. Cmax is the mean maximum plasma concentration. AUC0-t is the mean area under the curve until the last quantifiable concentration. In a preferred embodiment of the present invention, the TTS contains a controlled release rotigotine formulation for transdermal administration to human patients, comprising from about 4 to about 20 mg rotigotine, said formulation resulting in a mean maximum plasma concentration (Cmax) of rotigotine from about 0.14 ng/mL to about 1.54 ng/mL and a mean area under the curve up to the last quantifiable concentration (AUC0-t) from about 3.3 ng/mL*h to about 32.2 ng/mL*h.
In a preferred embodiment of the present invention, the TTS contains a controlled release rotigotine formulation for transdermal administration to human patients, comprising from about 4.5 to about 18 mg rotigotine, said formulation providing a mean maximum plasma concentration (Cmax) of rotigotine from about 0.14 ng/mL to about 1.54 ng/mL and a mean area under the curve up to the last quantifiable concentration (AUC0-t) from about 3.3 ng/mL*h to about 32.2 ng/mL*h.
In still another preferred embodiment, the TTS is used in a method for inducing a steady-state rotigotine pharmacokinetic profile over a 24 hour period in a human patient suffering from Parkinson's Disease, wherein the Cmax of rotigotine is from about 0.14 ng/mL to about 1.54 ng/mL and the AUC0-t is from about 3.3 ng/mL*h to about 32.2 ng/mL*h, said method comprising administering rotigotine to said human patient. In an embodiment, the invention relates to a method for treating Parkinson's Disease in a human patient, comprising administering to the patient a rotigotine formulation capable of providing a plasma concentration effective to alleviate the symptoms of Parkinson's Disease, wherein the Cmax is from about 0.14 ng/mL to about 1.54 ng/mL and wherein the mean area under the curve (AUC0-t) is from about 3.3 ng/mL*h to about 32.3 ng/mL*h. In certain embodiments, the formulation is administered daily in 24 hour intervals. In another embodiment, the invention relates to a method for treating Parkinson's Disease in a human patient, comprising administering to the patient a rotigotine formulation capable of maintaining a plasma concentration effective to alleviate the symptoms of Parkinson's Disease, wherein the Cmax is sustained at a level from about 0.14 ng/mL to about 1.54 ng/mL and wherein the mean area under the curve (AUCT) is from about 3.3 ng/mL*h to about 32.2 ng/mL*h.
In yet another embodiment, the invention relates to a method of treating Parkinson's Disease in a human patient, comprising applying a transdermal therapeutic system (TTS) comprising rotigotine, wherein the TTS is capable of providing a plasma concentration effective to alleviate the symptoms of Parkinson's Disease, wherein the Cmax is from about 0.14 ng/mL to about 1.54 ng/mL and wherein the mean area under the curve (AUC0-t) is from about 3.3 ng/mL*h to about 32.2 ng/mL*h.
In a further embodiment, the invention relates to a method of treating Parkinson's Disease in a human patient comprising applying one or more transdermal patches comprising an amount of rotigotine from 4 mg to 20 mg to the human patient; so as to produce in the human patient a mean maximum plasma concentration (Cmax) of rotigotine effective to alleviate the symptoms of Parkinson's Disease in the human patient, wherein the Cmax of rotigotine in the patient is sustained at a level from about 0.14 ng/mL to about 1.54 ng/mL and the last quantifiable concentration (AUC0-t) of the rotigotine in the patient is sustained at a level from about 3.3 ng/mL*h to about 32.2 ng/mL*h.
c) repeating step b) as required to sustain the Cmax of rotigotine in the human patient at a level effective to alleviate the symptoms of Parkinson's Disease in the human patient wherein the Cmax of rotigotine is sustained at a level from about 0.14 ng/mL to about 1.54 ng/mL. In a preferred embodiment of the invention, the Cmax of rotigotine in the human patient is sustained from 3 days to 28 weeks, from 1 to 7 days, from 1 to 6 weeks, for 7 weeks, from 8 to 28 weeks or for 28 weeks. In another preferred embodiment of the invention, the patch or patches are removed and another patch or patches are applied daily, twice daily, weekly, twice weekly, monthly or twice monthly. In other, preferred aspects of the invention, the Cmax of rotigotine in the human patient is sustained at a level from about 0.20 ng/mL to about 1.30 ng/mL; from about 0.30 ng/mL to about 1.20 ng/mL; from about 0.14 ng/mL to about 0.48 ng/mL; from about 0.37 ng/mL to about 0.75 ng/mL; or from about 0.84 ng/mL to about 1.54 ng/mL. In yet other preferred aspects of the invention, the induced Cmax is about 0.31 ng/mL; about 0.56 ng/mL; or about 1.19 ng/mL. In one embodiment, the invention relates to a controlled release rotigotine formulation for transdermal administration to human patients, wherein said formulation is capable of providing a plasma concentration effective to alleviate the symptoms of Parkinson's Disease regardless of where it is applied on the body of said human patient. In a preferred embodiment, the patients are suffering from Parkinson's disease. In another preferred embodiment, the patients are suffering from restless legs syndrome. In still another embodiment, the patients are suffering from a disease related to the dopaminergic system. In another embodiment, the invention relates to a method for inducing a steady-state rotigotine pharmacokinetic profile over a 24 hour period in a human patient in need thereof comprising administering rotigotine to said human patient, wherein the Cmax of rotigotine is from about 0.14 ng/mL to about 1.54 ng/mL and the AUC0-t is from about 3.3 ng/mL *h to about 32.2 ng/mL*h, wherein the method gives the same Cmax and AUC0-t regardless of where the rotigotine is administered to the body of the human patient. In another embodiment, the invention relates to a method for treating Parkinson's Disease in a human patient, comprising administering to the patient over a 24 hr period a rotigotine formulation capable of providing a plasma concentration effective to alleviate the symptoms of Parkinson's Disease, wherein the Cmax is from about 0.14 ng/mL to about 1.54 ng/mL and the AUC0-t is from about 3.3 ng/mL*h to about 32.2 ng/mL*h.
In another embodiment, the invention relates to a method provides the same plasma concentration effective to alleviate the symptoms of Parkinson' disease regardless of where the rotigotine is administered to the body of the human patient. In yet another embodiment, the invention relates to a method of treating Parkinson's Disease in a human patient comprising applying one or more transdermal patches comprising an amount of rotigotine from 4 mg to 20 mg to the patient to provide a plasma concentration effective to alleviate the symptoms of Parkinson's Disease in the human patient, wherein the Cmax is sustained at a level from about 0.14 ng/mL to about 1.54 ng/mL and the mean area under the curve (AUC0-t) of the rotigotine in the patient is from about 3.3 ng/mL*h to about 32.2 ng/mL*h.
In an embodiment of the invention, a single daily dose of rotigotine should be initiated and then increased in increments to an effective dose. In another embodiment, the dose is administered with a transdermal therapeutic system (TTS). In yet another embodiment, the TTS is applied once a day. In a further embodiment, the TTS should be applied at the same time every day. In another embodiment, the application site of the TTS should be moved on a daily basis, for example from the right side to the left side and from the upper body to the lower body. In certain embodiments, the transdermal system is replaced every 48 hours preferably every 24 hours. The application site does not affect the pharmacokinetic profile. In non-limiting examples the TTS can be applies to the front of the abdomen, thigh, hip, flank, shoulder or upper arm. Preferably the TTS is moved on a daily basis, for example from the right side to the left side, from the upper body to the lower body. Preferable the TTS is not applied to the same site more than once every 7 days, 10 days, 14 days, 17 days or 21 days. The present invention is illustrated by the following examples, without limiting the scope of the invention. AUC0-t: area under the curve from zero up to the last quantifiable concentration. AUC(0-48): area under the curve from zero up to 48 hours after administration. AUC0-inf: area under the curve from zero up to infinity calculated using the area under the curve after the first 24 hours (AUC0-24) and extrapolating to infinity such that AUC0-inf=AUC0-24+plasma concentration at 24 hours/kel. Ctrough: measured trough plasma concentration. Cmax,τ: maximum measured plasma concentration during a dose interval, τ.
Cmin: minimum measured plasma concentration. Cmin,τ: minimum measured plasma concentration during a dose interval τ.
kel: rate constant of elimination. LLQ: lower limit of quantification. swing: fluctuation of the plasma concentration calculated by (Cmax-Cmin)/(0.5*Cmax+0.5*Cmin)*100%. tlag: lag time; elapsed time until onset of absorption. In a first period, a single silicone patch A was administered to each of 14 healthy male subjects (Caucasian race, aged 18-50 years) for a period of 24 hours. After a six day wash-out period, the same subjects were in randomized order administered either a single acrylic patch B for 24 hours in the second period followed another six day wash-out period and then administered two silicone patches A for 24 hours in the third period or administered two silicone patches A for 24 hours in the second period followed another six day wash-out period and then administered a single acrylic patch B for 24 hours in the third period. The silicone patches, had a rotigotine content of 9 mg/20 cm2 and the acrylic patches had a rotigotine content of 33.48 mg/20 cm2. During each study period blood samples for the analysis of rotigotine were taken before patch application and at 1 h, 2 h, 4 h, 6 h, 8 h, 12 h, 15 h, 23 h, 24 h, 25 h, 26 h, 27 h, 28 h, 30 h, 32 h, 36 h, 40 h and 48 h after first patch application. To characterize the pharmacokinetics of rotigotine after administration of rotigotine patches in healthy volunteers, the maximum plasma concentration (Cmax) and the corresponding timepoint (tmax) were taken and the data was separated by formulation (and dose). For each sequence of plasma concentrations the AUC was calculated using the trapezoidal rule. AUC(0-t) represents the AUC from patch administration up to the last quantifiable plasma concentration (e.g., if the concentration dropped to below quantifiable levels in less than 48 hours) whereas AUC(0-48) presents the AUC from patch administration to the last sampling point, 48 h after start of administration. The total body clearance was calculated from the individual apparent dose and the corresponding AUC. AUC was the individual area under the concentration time curve extrapolated to infinity: AUC=AUC(0-t)+C(t)/kel, where C(t) is the last quantificable plasma concentration. Data for the rotigotine plasma concentrations and pharmacokinetic parameters measured during this clinical trial for the silicone patches are provided in Tables 3, 4, 5, and 6. Data for rotigotine plasma concentration for the acrylic patch are provided in Tables 7 and 8. FIGS. 1 and 2 illustrate the arithmetic mean of rotigotine plasma concentration for single dose administration of the silicone patch. FIG. 3 illustrates the arithmetic mean of rotigotine plasma concentration for single dose administration of the acrylic patch. transdermal administration of 9.0 mg rotigotine with Patch A (n.s. = no sample). 11 0 0 0.178 0.862 1.07 1.04 0.945 0.764 0.194 n.s. 11 n.s. n.s. n.s. n.s. n.s. n.s. n.s. n.s. n.s. The silicone patches had a rotigotine content of 4.5 mg/10cm2. During the study blood samples for the analysis of rotigotine were taken before patch administration and at 1, 2, 4, 6, 12, 24, 48, 72, 96, 120, 144, 168, 192, 216, 240, 264, 288, 312, 316, 320, 324, 336, 337, 338, 339, 340, 342, 344, 350, 360, 372, and 384 hours after first patch administration. To characterize the pharmacokinetics of rotigotine after multiple dose administration of rotigotine patches in healthy volunteers the maximum plasma concentration (Cmax) and the corresponding timepoint (tmax) were taken and the data separated by subject. For each time sequence of plasma concentrations the AUC was calculated using the trapezoidal rule. AUC(312-336) represents the AUC within the dose interval of 24 hours under steady state administration. Data for the rotigotine plasma concentrations and pharmacokinetic parameters measured during this trial are provided in Tables 9 and 10. FIGS. 4 and 5 illustrate the arithmetic mean of rotigotine plasma concentration during and after multiple patch administration. transdermal administration of 4.5 mg rotigotine with Patch C.
01 0 0 0 .0474 .066 .151 .155 .191 .153 .154 .175 n.s. n.s. n.s. n.s. n.s. n.s. 01 n.s. n.s. n.s. n.s. n.s. n.s. n.s. n.s. n.s. n.s. n.s. n.s. n.s. n.s. n.s. n.s. Both patch types contained 4.5 mg rotigotine/10 cm2. In a first period, patches were administered singly to the subjects for 24 hours. After a washout period of 7 days, the other patch was administered for 24 hours. During the study blood samples for the analysis of rotigotine were taken before patch application and at, 1, 2, 4, 6, 8, 10, 12, 15, 23, 24, 25, 26, 27, 28, 30, 36 and 48 hours after first patch application The study was done under in-patient conditions except for the urine collection at 36-48 hours and the 48 h blood collection (which were performed on an ambulatory basis). Data for rotigotine plasma concentrations and pharmacokinetic parameters measured during this clinical are provided in Tables 11, 12, 13, 14, and 15. FIGS. 6 and 7 illustrate the arithmetic mean of rotigotine plasma concentration for single patch administration. Table 15 summarizes the results of a statistical test to show that the two patch formulations are bioequivalent. Rotigotine doses included 4.5 mg/day (Patch D), 9.0 mg/day (Patch E), 13.5 mg/day (Patch F), and 18.0 mg/day (2× Patch E). The trial consisted of an Eligibility Assessment (EA), a 24-day Titration Phase (4.5 to 18.0 mg/day doses; incremental increases of 4.5 mg/day every 6 days), a 6-day Maintenance Phase (18.0 mg/day dose), a 6-day De-escalation Phase (13.5/9.0/4.5 mg/day decreasing dose every 2 days), and a Safety Follow-Up visit 2 days following the last dose. A total of 70 subjects were enrolled and randomized; 63 subjects were analyzed for the primary pharmacokinetic (PK) variables and 58 subjects were analyzed for the primary pharmacodynamic variables. The objectives of this trial included the following: 1) to characterize the pharmacokinetic profile of rotigotine during 24 hour intervals where the skin site of patch application was rotated in subjects with early-stage Parkinson's disease, 2) to investigate the electrocardiographic effects of rotigotine over a 24 hour period under maximal anticipated therapeutic exposure in subjects with early-stage Parkinson's disease, and 3) to investigate the safety and local tolerability of a rotigotine transdermal patch under maximal anticipated therapeutic exposure. The 18.0 mg/day dose used 2×20 cm2 patches. Initial doses were 4.5 mg/day with weekly increases of 4.5 mg/day to a maximum target dose of 18.0 mg/day. Blood samples were collected before patch administration and on the days and at the times indicated in Table 16. Mean plasma concentrations versus time for each of the six application sites using combined data from Days 27 and 30 are shown in the FIG. 8. Mean plasma concentrations of unconjugated rotigotine were similar between the six application sites. Starting with a plasma concentration at Time 0 (prior to patch removal, Ctrough) of about 1 ng/mL, the concentration decreased within 2 hours by about 0.2 ng/mL, followed by an increase back up to the level of the trough plasma concentration. FIG. 9 illustrates a plasma concentration over time for all patch application sites. Table 16 reports the result of descriptive statistics of plasma concentrations for unconjugated rotigotine separated by the day of administration, the time of sampling after actual administration and the site of patch administration. Summary statistics for AUC0-t,ss and Cmax, ss for unconjugated rotigotine for each patch application site using separated data for Day 27 and Day 30 are given in Table 17. Table 18 shows the summary statistics foe AUC0-t,ss and Cmax, ss for unconjugated rotigotine for each site combined data from Day 27 and Day 30. The doses included 4.5 mg/day, 9 mg/day, and 13.5 mg/day of rotigotine. Trial periods consisted of a 4-week pre-treatment (washout) period, a 3-week dose escalation period, a 25-week dose maintenance period, and a 4-week follow-up period for a total duration of 36 weeks. Plasma samples for measurement of rotigotine concentration were collected in 56 subjects. The total number of samples was 1297. During the study blood samples for the analysis of rotigotine were taken before patch application and at 1, 2, 3, 11, 19, and 28 weeks after first patch application. Table 19 shows the results of descriptive statistics for concentrations of rotigotine in plasma samples. FIG. 10 illustrates the results. This figure shows stable concentration over the maintenance phase of the study. 1. A method for treating Parkinson's Disease in a human patient, comprising administering to the patient a rotigotine formulation capable of providing a plasma concentration effective to alleviate the symptoms of Parkinson's Disease, wherein the Cmax is from about 0.14 ng/mL to about 1.54 ng/mL and wherein the mean area under the curve (AUC0-t) is from about 3.3 ng/mL*h to about 32.2 ng/mL*h.
2. The method of claim 1, wherein the rotigotine is transdermally administered. 3. The method of claim 1, wherein the Cmax is from about about 0.20 ng/mL to about 1.30 ng/mL. 4. The method of claim 1, wherein the Cmax is from about 0.30 ng/mL to about 1.20 ng/mL. 5. The method of claim 1, wherein the Cmax is from about 0.14 ng/mL to about 0.48 ng/mL. 6. The method of claim 1, wherein the Cmax is from about 0.37 ng/mL to about 0.75 ng/mL. 7. The method of claim 1, wherein the Cmax is from about 0.84 ng/mL to about 1.54 ng/mL. 8. The method of claim 1, wherein the Cmax is about 0.31 ng/mL. 9. The method of claim 1, wherein the Cmax is about 0.56 ng/mL. 10. The method of claim 1, wherein the Cmax is about 1.19 ng/mL. 11. The method of claim 1, wherein the AUC0-t is from about 4.0 ng/mL*h to about 30.0 ng/mL*h.
12. The method of claim 1, wherein the AUC0-t is from about 5.0 ng/mL*h to about 25.0 ng/mL*h.
13. The method of claim 1, wherein the AUC0-t is from about 3.3 ng/mL*h to about 8.9 ng/mL*h.
14. The method of claim 1, wherein the AUC0-t is from about 7 ng/mL*h to about 15.2 ng/mL*h.
15. The method of claim 1, wherein the AUC0-t is from about 15.2 ng/mL*h to about 32.2 ng/mL*h.
16. The method of claim 1, wherein the AUC0-t is about 6.1 ng/mL*h.
17. The method of claim 1, wherein the AUC0-t is about 11.1 ng/mL*h.
18. The method of claim 1, wherein the AUC0-t is about 23.7 ng/mL*h.
19. The method of claim 1, wherein the method provides the plasma concentration effective to alleviate the symptoms of Parkinson's disease regardless of where the rotigotine is administered to the body of the human patient. 20. A method for treating Parkinson's Disease in a human patient, comprising administering to the patient a rotigotine formulation capable of maintaining a plasma concentration effective to alleviate the symptoms of Parkinson's Disease, wherein the Cmax is sustained at a level from about 0.14 ng/mL to about 1.54 ng/mL and wherein the mean area under the curve (AUC0-t) is from about 3.3 ng/mL*h to about 32.2 ng/mL*h.
21. The method of claim 20, wherein the rotigotine is transdermally administered. 22. The method of claim 20, wherein the Cmax is from about about 0.20 ng/mL to about 1.30 ng/mL. 23. The method of claim 20, wherein the Cmax is from about 0.30 ng/mL to about 1.20 ng/mL. 24. The method of claim 20, wherein the Cmax is from about 0.14 ng/mL to about 0.48 ng/mL. 25. The method of claim 20, wherein the Cmax is from about 0.37 ng/mL to about 0.75 ng/mL. 26. The method of claim 20, wherein the Cmax is from about 0.84 ng/mL to about 1.54 ng/mL. 27. The method of claim 20, wherein the Cmax is about 0.31 ng/mL. 28. The method of claim 20, wherein the Cmax is about 0.56 ng/mL. 29. The method of claim 20, wherein the Cmax is about 1.19 ng/mL. 30. The method of claim 20, wherein the AUC0-t is from about 4.0 ng/mL*h to about 30.0 ng/mL*h.
31. The method of claim 20, wherein the AUC0-t is from about 5.0 ng/mL*h to about 25.0 ng/mL*h.
32. The method of claim 20, wherein the AUC0-t is from about 3.3 ng/mL*h to about 8.9 ng/mL*h.
33. The method of claim 20, wherein the AUC0-t is from about 7 ng/mL*h to about 15.2 ng/mL*h.
34. The method of claim 20, wherein the AUC0-t is from about 15.2 ng/mL*h to about 32.2 ng/mL*h.
35. The method of claim 20, wherein the AUC0-t is about 6.1 ng/mL*h.
36. The method of claim 20, wherein the AUC0-t is about 11.1 ng/mL*h.
37. The method of claim 20, wherein the AUC0-t is about 23.7 ng/mL*h.
38. The method of claim 20, wherein the method provides the plasma concentration effective to alleviate the symptoms of Parkinson's disease regardless of where the rotigotine is administered to the body of the human patient. 39. A method of treating Parkinson's Disease in a human patient, comprising applying a transdermal therapeutic system (TTS) comprising rotigotine, wherein the TTS is capable of providing a plasma concentration effective to alleviate the symptoms of Parkinson's Disease, wherein the Cmax is from about 0.14 ng/mL to about 1.54 ng/mL and wherein the mean area under the curve (AUCo-t) is from about 3.3 ng/mL*h to about 32.2 ng/mL*h.
40. The method of claim 39, wherein the Cmax is from about about 0.20 ng/mL to about 1.30 ng/mL. 41. The method of claim 39, wherein the Cmax is from about 0.30 ng/mL to about 1.20 ng/mL. 42. The method of claim 39, wherein the Cmax is from about 0.14 ng/mL to about 0.48 ng/mL. 43. The method of claim 39, wherein the Cmax is from about 0.37 ng/mL to about 0.75 ng/mL. 44. The method of claim 39, wherein the Cmax is from about 0.84 ng/mL to about 1.54 ng/mL. 45. The method of claim 39, wherein the Cmax is about 0.31 ng/mL. 46. The method of claim 39, wherein the Cmax is about 0.56 ng/mL. 47. The method of claim 39, wherein the Cmax is about 1.19 ng/mL. 48. The method of claim 39, wherein the AUC0-t is from about 4.0 ng/mL*h to about 30.0 ng/mL*h.
49. The method of claim 39, wherein the AUC0-t is from about 5.0 ng/mL*h to about 25.0 ng/mL*h.
50. The method of claim 39, wherein the AUC0-t is from about 3.3 ng/mL*h to about 8.9 ng/mL*h.
51. The method of claim 39, wherein the AUC0-t is from about 7 ng/mL*h to about 15.2 ng/mL*h.
52. The method of claim 39, wherein the AUC0-t is from about 15.2 ng/mL*h to about 32.2 ng/mL*h.
53. The method of claim 39, wherein the AUC0-t is about 6.1 ng/mL*h.
54. The method of claim 39, wherein the AUC0-t is about 11.1 ng/mL*h.
55. The method of claim 39, wherein the AUC0-t is about 23.7 ng/mL*h.
56. The method of claim 39, wherein the method provides the plasma concentration effective to alleviate the symptoms of Parkinson's disease regardless of where the rotigotine is administered to the body of the human patient. 57. A method for treating Parkinson's Disease in a human patient, comprising administering to the patient over a 24 hr period a rotigotine formulation capable of providing a plasma concentration effective to alleviate the symptoms of Parkinson's Disease, wherein the Cmax is from about 0.14 ng/mL to about 1.54 ng/mL and the AUC0-t is from about 3.3 ng/mL*h to about 32.2 ng/mL*h.
58. The method of claim 57, wherein the rotigotine is transdermally administered. 59. The method of claim 57, wherein the Cmax is from about about 0.20 ng/mL to about 1.30 ng/mL. 60. The method of claim 57, wherein the Cmax is from about 0.30 ng/mL to about 1.20 ng/mL. 61. The method of claim 57, wherein the Cmax is from about 0.14 ng/mL to about 0.48 ng/mL. 62. The method of claim 57, wherein the Cmax is from about 0.37 ng/mL to about 0.75 ng/mL. 63. The method of claim 57, wherein the Cmax is from about 0.84 ng/mL to about 1.54 ng/mL. 64. The method of claim 57, wherein the Cmax is about 0.31 ng/mL. 65. The method of claim 57, wherein the Cmax is about 0.56 ng/mL. 66. The method of claim 57, wherein the Cmax is about 1.19 ng/mL. 67. The method of claim 57, wherein the AUC0-t is from about 4.0 ng/mL*h to about 30.0 ng/mL*h.
68. The method of claim 57, wherein the AUC0-t is from about 5.0 ng/mL*h to about 25.0 ng/mL*h.
69. The method of claim 57, wherein the AUC0-t is from about 3.3 ng/mL*h to about 8.9 ng/mL*h.
70. The method of claim 57, wherein the AUC0-t is from about 7 ng/mL*h to about 15.2 ng/mL*h.
71. The method of claim 57, wherein the AUC0-t is from about 15.2 ng/mL*h to about 32.2 ng/mL*h.
72. The method of claim 57, wherein the AUC0-t is about 6.1 ng/mL*h.
73. The method of claim 57, wherein the AUC0-t is about 11.1 ng/mL*h.
74. The method of claim 57, wherein the AUC0-t is about 23.7 ng/mL*h.
75. The method of claim 57, wherein the method provides the plasma concentration effective to alleviate the symptoms of Parkinson's disease regardless of where the rotigotine is administered to the body of the human patient. 76. A method of treating Parkinson's Disease in a human patient comprising applying one or more transdermal patches comprising an amount of rotigotine from 4 mg to 20 mg to the patient to provide a plasma concentration effective to alleviate the symptoms of Parkinson's Disease in the human patient, wherein the Cmax is sustained at a level from about 0.14 ng/mL to about 1.54 ng/mL and the mean area under the curve (AUCo-t) in the patient is from about 3.3 ng/mL*h to about 32.2 ng/mL*h.
77. The method of claim 76, wherein the Cmax is from about 0.20 ng/mL to about 1.30 ng/mL. 78. The method of claim 76, wherein the Cmax is from about 0.30 ng/mL to about 1.20 ng/mL. 79. The method of claim 76, wherein the Cmax is from about 0.14 ng/mL to about 0.48 ng/mL. 80. The method of claim 76, wherein the Cmax is from about 0.37 ng/mL to about 0.75 ng/mL. 81. The method of claim 76, wherein the Cmax is from about 0.84 ng/mL to about 1.54 ng/mL. 82. The method of claim 76, wherein the Cmax is about 0.31 ng/mL. 83. The method of claim 76, wherein the Cmax is about 0.56 ng/mL. 84. The method of claim 76, wherein the Cmax is about 1.19 ng/mL. 85. The method of claim 76, wherein the AUC0-t is from about 4.0 ng/mL*h to about 30.0 ng/mL*h.
86. The method of claim 76, wherein the AUC0-t is from about 5.0 ng/mL*h to about 25.0 ng/mL*h.
87. The method of claim 76, wherein the AUC0-t is from about 3.3 ng/mL*h to about 8.9 ng/mL*h.
88. The method of claim 76, wherein the AUC0-t is from about 7 ng/mL*h to about 15.2 ng/mL*h.
89. The method of claim 76, wherein the AUC0-t is from about 15.2 ng/mL*h to about 32.2 ng/mL*h.
90. The method of claim 76, wherein the AUC0-t is about 6.1 ng/mL*h.
91. The method of claim 76, wherein the AUC0-t is about 11.1 ng/mL*h.
92. The method of claim 76, wherein the AUC0-t is about 23.7 ng/mL*h.
93. The method of claim 76, wherein the method provides the plasma concentration effective to alleviate the symptoms of Parkinson's disease regardless of where the rotigotine is administered to the body of the human patient. wherein the Cmax is sustained at a level from about 0.14 ng/mL to about 1.54 ng/mL. 95. The method of claim 94, wherein the Cmax is from about 0.20 ng/mL to about 1.30 ng/mL. 96. The method of claim 94, wherein the Cmax is from about 0.30 ng/mL to about 1.20 ng/mL. 97. The method of claim 94, wherein the Cmax is from about 0.14 ng/mL to about 0.48 ng/mL. 98. The method of claim 94, wherein the Cmax is from about 0.37 ng/mL to about 0.75 ng/mL. 99. The method of claim 94, wherein the Cmax is from about 0.84 ng/mL to about 1.54 ng/mL. 100. The method of claim 94, wherein the Cmax is about 0.31 ng/mL. 101. The method of claim 94, wherein the Cmax is about 0.56 ng/mL. 102. The method of claim 94, wherein the Cmax is about 1.19 ng/mL. 103. The method of claim 94, wherein the Cmax is sustained at a level effective to alleviate the symptoms of Parkinson's Disease in the human patient for a period from 1 day to 7 days. 104. The method of claim 94, wherein the Cmax is sustained at a level effective to alleviate the symptoms of Parkinson's Disease in the human patient for a period of time is from 1 week to 6 weeks. 105. The method of claim 94, wherein the Cmax is sustained at a level effective to alleviate the symptoms of Parkinson's Disease in the human patient for a period of time is 7 weeks. 106. The method of claim 94, wherein the Cmax is sustained at a level effective to alleviate the symptoms of Parkinson's Disease in the human patient for a period of time is from 8 weeks to 28 weeks. 107. The method of claim 94, wherein the method gives the plasma concentration effective to alleviate the symptoms of Parkinson's Disease regardless of where the patches are applied on the body of the human patient. 108. The method of claim 94, wherein the patch or patches are replaced daily. 109. The method of claim 94, wherein the Cmax is sustained at a level effective to alleviate the symptoms of Parkinson's Disease in the human patient for a period of time from 1 day to 28 weeks. 110. A method for treating Parkinson's Disease in a human patient, comprising administering over a 24 hour period a rotigotine formulation capable of providing a plasma concentration effective to alleviate the symptoms of Parkinson's Disease, wherein the Cmax is from about 0.14 ng/mL to about 1.54 ng/mL and the AUC0-t is from about 3.3 ng/mL*h to about 32.2 ng/mL*h, regardless of where the rotigotine is administered to the body of the human patient. 111. A controlled release rotigotine formulation for transdermal administration to a human patient, comprising from about 4 mg to about 20 mg of rotigotine, wherein the formulation provides a plasma concentration wherein the (Cmax) of rotigotine is from about 0.14 ng/mL to about 1.54 ng/mL and a mean area under the curve up to the last quantifiable concentration (AUCT) from about 3.3 ng/mL*h to about 32.2 ng/mL*h, regardless of where the rotigotine formulation is applied on the body of the human patient. 112. The formulation of claim 111, wherein said human patient is suffering from Parkinson's Disease. 113. The formulation of claim 111 wherein the formulation is present as a Transdermal Therapeutic System (TTS) consisting of a protective liner, a self-adhesive drug matrix layer consisting of at least the active component rotigotine and a flexible backing which is preferably siliconised on its inner side and is consisting of an aluminized polyester foil coated with a pigment layer on the outer side. 115. A method for inducing treating Restless Legs Syndrome in a human patient, comprising administering a rotigotine formulation capable of providing a plasma concentration effective to alleviate symptoms of Restless Legs Syndrome, wherein the Cmax is from about 0.14 ng/mL to about 1.54 ng/mL and the AUC0-t is from about 3.3 ng/mL*h to about 32.2 ng/mL*h.
116. A method for treating Restless Legs Syndrome in a human patient, comprising administering to the patient over a 24 hr period a rotigotine formulation capable of providing a plasma concentration effective to alleviate the symptoms of Restless Legs Syndrome, wherein the Cmax is from about 0.14 ng/mL to about 1.54 ng/mL and the AUC0-t is from about 3.3 ng/mL*h to about 32.2 ng/mL*h.
117. The method of claim 116, wherein the method provides the plasma concentration effective to alleviate the symptoms of Restless Legs Syndrome regardless of where the rotigotine is administered to the body of the human patient. 118. A method for treating a disease related to the dopaminergic system in a human patient, comprising administering to the patient over a 24 hr period a rotigotine formulation capable of providing a plasma concentration effective to alleviate the symptoms of the disease related to the dopaminergic system, wherein the Cmax is from about 0.14 ng/mL to about 1.54 ng/mL and the AUC0-t is from about 3.3 ng/mL*h to about 32.2 ng/mL*h.
119. A method for treating a disease related to the dopaminergic system in a human patient, comprising administering rotigotine to the patient wherein the Cmax is from about 0.14 ng/mL to about 1.54 ng/mL and wherein the AUC0-t is from about 3.3 ng/mL*h to about 32.2 ng/mL*h.
120. The method of claim 119, wherein the method provides the plasma concentration effective to alleviate the symptoms of the disease related to the dopaminergic system regardless of where the rotigotine is administered to the body of the human patient. ES2256780T3 (en) 2006-07-16 improved transdermal delivery system for rotigotine. EP0409910A1 (en) 1991-01-30 Laminated composite for transdermal administration of fentanyl.